Could information from birth records, thoughtfully assembled and simply scored, be used to help communities more efficiently and equitably allocate resources? This question emerged during a conversation among colleagues from the Children’s Data Network, First 5 Association, and Heising-Simons Foundation. We had gathered to discuss the challenges County Commissions, service providers, funders, legislators, and advocates face when assessing the service needs of families with young children. Due, in large part, to a dearth of recent, publically available data on young children and families, we lamented that they have to conduct costly community needs assessments, use survey-based county estimates for neighborhood-level program planning, extrapolate historical data about adults into actionable information about current families with newborns, and base many decisions on a community’s poverty level – there had to be a better way! The idea for the California Strong Start Index was born. Successful proof-of-concept analyses funded by First 5 LA and the Orange County Commission on Children and Families confirmed that administrative birth records could be used to not only better characterize the changing demographics and birth outcomes of babies born in LA County, but also help Los Angeles County chart a course toward universal and targeted Home Visiting. And First 5 colleagues immediately recognized the potential for an index comprised of information from administrative birth records to provide recent, specific, holistic, and asset-focused information about the children they were charged with supporting. Geocoded records could be aggregated and viewed at a state level, but also provide granular, local information to support equitable resource allocation. These child / family-level indicators could be flexibly overlaid with other community-level indicators or indices. These data could develop a much more complete picture of our state’s children. And they could be easily updated for each new cohort of children born. 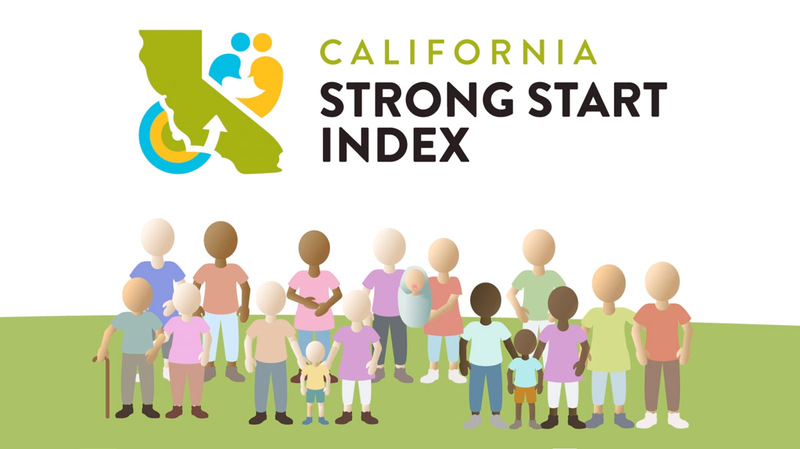 In partnership with the First 5 Association, Heising-Simons Foundation, and First 5 County Commissions, we are proud to announce the launch of the California Strong Start Index. This powerful, but simple tool uses data that already exist for children and families to summarize, in a standardized way, the conditions into which children are born. It comprises a total of 12 variables that fall into four domains. A birth asset score is calculated by simply counting the number of assets present (0-12). The Strong Start Index allows us to characterize the number of assets children have at birth, including how California communities vary in the distribution of children at different asset levels. Please visit www.strongstartindex.org to view the animation, explore the data, and to learn more about how communities are using it to facilitate equitable investment in the children and families of California. And please see our project page for detailed methodological documentation.